Moms are pretty much always running, in one form or another! We’re celebrating moms with a Mother's Day gift that you can look forward to doing together - whether for your mom, daughter, sister or friend (or you!). We’ve designed this special women's cut t-shirt for Mother’s Day. Orders placed locally (CT/MA) by May 6th will be available in time for Mother’s Day (sent by mail to you or they can be picked up at HMF offices in Glastonbury). 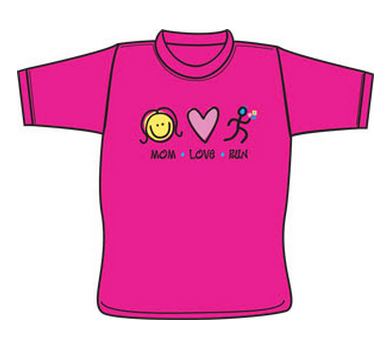 While a great gift itself for $20 the shirt can be packaged with discounted gift registration to our popular women’s-only 5K run/walk for $40 - available for purchase here. 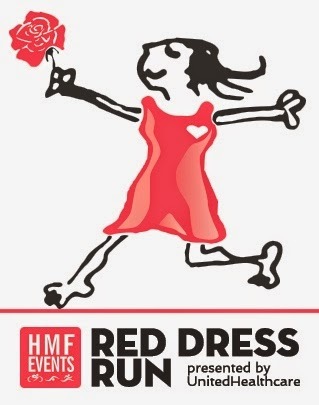 The July 12th Red Dress Run for Women, presented by United Healthcare, is a day of women’s wellness and fun for you to give as a gift or participate in together! This 5K run/walk just for women takes place in West Hartford’s beautiful Elizabeth Park, home of 15,000 blooming roses. The atmosphere of the event is supportive and inspiring, with women of all ages and fitness levels coming together with the common goal of crossing that finish line. New this year, we’re coordinating a women’s health seminar with Hartford Hospital on women in endurance sports - stay tuned for more details. Each year, there are three experiences that I can always count on to lift my spirits in a highly exciting yet deeply humbling manner. These experiences make me so happy to be alive and doing what I do each and every day. The first – standing at the start of the Hartford Marathon and Half Marathon as 15,000 runners pass in front of me, knowing that I played a small part in bringing together this sea of humanity. The second – turning onto Main Street in Manchester on Thanksgiving morning as one of thousands in the Manchester Road Race. The third is being part of the Boston Marathon on Patriot’s Day. Like so many I was hurt to my core by the bombings at Boston. Seeing that iconic finish line devastated brought tears to my eyes and pain to my heart. No one should mess with the Boston Marathon - period. And yet, two evil knuckleheads did just that, causing life-altering pain and sadness for so many. Their acts forever changed the way we do things in the road race business. I took this very personally, although I was miles away. My heart broke for the victims and for the man I most admire in the business, Dave McGillivray, the Race Director of the Boston Marathon. Through this horrible darkness of evil came great light. Runners united and became a family. Boston showed its strength and resilience as a community. The world exhibited great compassion with their words and their actions. Donations poured into One Fund Boston, with nearly $61 million in donations for victims raised in the first 90 days. By the end of the year, there was over $12 million in new donations added to that. I will be at the finish line at Boston this year. 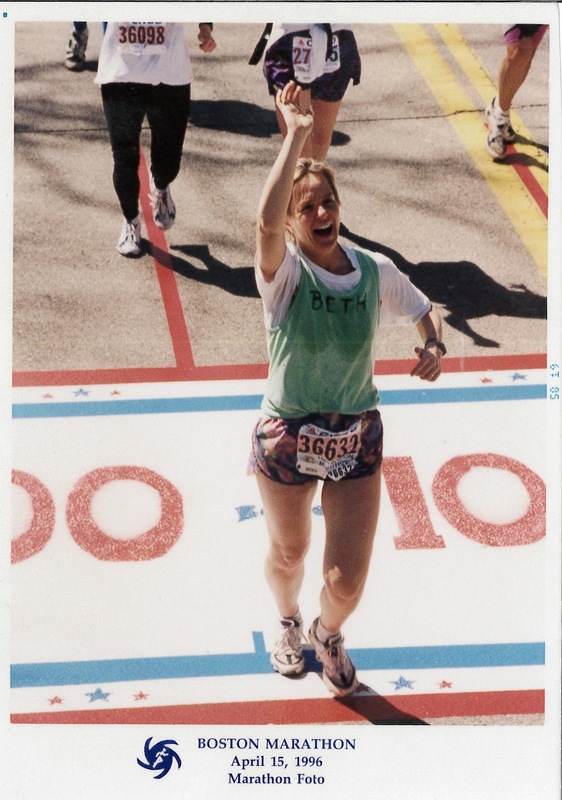 I crossed it as a runner six times, and participated in some form or another for 20 years. I will witness the joy of those finishing what they couldn’t finish last year. I will show my support for Dave McGillivray and the rest of the BAA. I will contribute to Dave’s chosen charity, the Martin Richard Charitable Foundation (http://teammr8.org). And I will cheer for Shalane Flanagan, the hometown girl, to win it all. The icing on the cake of a true celebration. National Volunteer Week is every week at HMF! Volunteers are truly at the heart of our events. The spirit of camaraderie is contagious when people get involved simply for the enjoyment of helping others. We’d petition for National Volunteer Week to be yearlong to recognize volunteer efforts - considering in 2013 alone, 2,500 HMF volunteers dedicated 11,600 hours, we have much to be thankful for…not sure a week will do it justice! To show our appreciation, all volunteers receive shirts and refreshments at every event. We also hope the volunteer incentive program, which provides earned credits off HMF events for registered volunteers, helps show our appreciation. You recognize some of the groups at annual events, our invaluable Collar Crew at the Hartford Marathon or Boy Scout Troop # 175 at the Amica Iron Horse Half Marathon and the West Hartford Exchange Club at the Blue Back Mitten Run. It’s inspiring to get so many school groups to join with us too - East Lyme High School Lacrosse, Glastonbury High School, Capital Prep Magnet School and Montessori Parent Teacher Community at Annie Fisher Montessori Magnet have been incredible supporters through the years. The invaluable massage therapists from the CT Sports Massage Team have taken care of countless runners. There are more individuals than we could possibly name, but we hope they each feel the gratitude and appreciation we have for them. Our volunteer program is led by Jess Hallet, who started as a volunteer with us about 10 years ago and has excelled in corralling all that incredible volunteer man-power! You’ll see Jess at events signing in and directing volunteers, she’s also available to help groups coordinate community service initiatives or company volunteer programs. Learn more about Jess in her own words below, and please remember to thank the volunteers you meet or pass on race day! Recruiting Volunteers: Reaching out to local communities before each race to recruit individual volunteers, groups, teams, clubs, and organizations for HMF Events. Managing Volunteers: Manage all online volunteer registration through a software system. Make sure there are enough volunteers for each aspect of every event. Communication: Communicate all instructions to volunteers ahead of time in addition to instructions on race day. Coordinate: Coordinate large volunteer groups for larger events. Set up and manage volunteer area/tent/food, manage volunteer check-in to ensure that volunteers receive the correct instructions for their volunteer activity and provide all volunteers with a volunteer shirt. My goal is to make volunteering with HMF a fun and easy activity to participate in to show volunteers how much we truly appreciate their help and support. I have volunteered with HMF for many years, maybe since 2003? I maintained a relationship with the HMF ever since. I began working as the Volunteer Program Manager in early August of 2013 - crazy time to start with the Hartford Marathon right around the corner, but I absolutely loved it! Everyone always asks me that, just because I work for a running organization doesn’t automatically mean I run…. 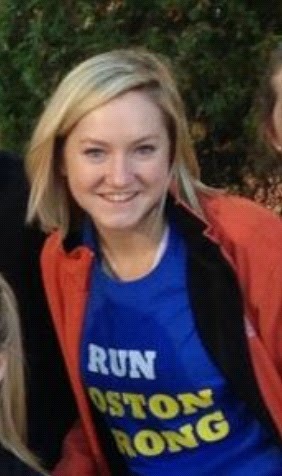 I definitely don’t run, however, I do love to cheer runners on at the events! Sandy Hook Run For The Families. It was an amazing event, truly inspirational. For such a small distance, it was so incredible to see how many people came out to run that day to support the families and people affected by Sandy Hook. The participants, volunteers, staff, sponsors, and spectators were so generous and supportive. This race was unlike any other and truly amazing to be a part of. Volunteering at the finish line of the Hartford Marathon. So much emotion and inspiration is generated by each participate that finishes. It is such a great accomplishment in life, the athletes are truly motivational. When there is a shortage of volunteers for a specific area. Thankfully we have an amazing crew that is able to react quickly and make it work for that day. Seeing the same volunteers at multiple HMF Events, who are always willing to help and contribute to their community. I feel so lucky to be able to interact with such great spirited and devoted individuals each and every day. USE THE BATHROOM. I tend to forget in the midst of all the action. VOLUNTEERS make our events happen. Our foundation is a volunteer-driven organization; we would not be here without the countless hours and dedication each volunteer contributes to the HMF events. Skiing, swimming, hiking, wakeboarding, dirt biking, and of course EATING! A big juicy burger or basically anything filling and unhealthy. I love spicy, bold flavors and love trying new things. The list of things I have to do for that day that continuously play in my head. We proudly present Team HMF! So many of you answered our call for runners who love our sport and want to shout it from the rooftops. We were overwhelmed with enthusiasm at the strength of the running community and willingness of so many to join in our mission. Credit must be given to every one of you who applied. Each submission showed individual strengths and told unique stories. Narrowing down a team of 25 was a gigantic feat. We feel fortunate to have had the opportunity to get to know so many of you. And now, we want everyone to get to know the inaugural Team HMF! This group of 15 women and 10 men represent fast and not-so-fast runners from diverse backgrounds and age groups. They come from throughout CT and southern MA. We will be telling their stories in more detail in the coming weeks so you too can get to know Team HMF better. From coaches and personal trainers to youth running supporters and a teacher, their paths are different but their passion is shared. Whether life-long runners or just starting to run recently, the members of Team HMF are excited to inspire and encourage. Many have been motivated by personal challenges to live healthier, be stronger and help others. Activities of Team HMF will be shared through the blog as well as on Facebook and Twitter. They will be accessible to the HMF community via social media, so runners can not only follow their progress but also ask them questions and learn from the Team’s experiences to help improve their own running. Please join us in wishing them the best and keep an eye out for Team HMF where you run! Ever wonder what makes an otherwise sane person decide to be a race director? Our new HMF blog is going to share a little bit about our journey in founding HMF. We will bring you behind the finish line to see the planning and execution involved in keeping thousands of runners, walkers, bikers and swimmers safe and happy each year. And, we hope to give you a glimpse at the incredibly inspiring, motivating and rewarding people we meet along the way – you, our HMF community.